Universidad de Burgos-ICCRAM (UBU-ICCRAM) is a privileged Research and Innovation core, that constitutes an Excellence International Center in Critical Raw Materials in synergy with a Competence Center devoted to Advanced Industrial Technologies. 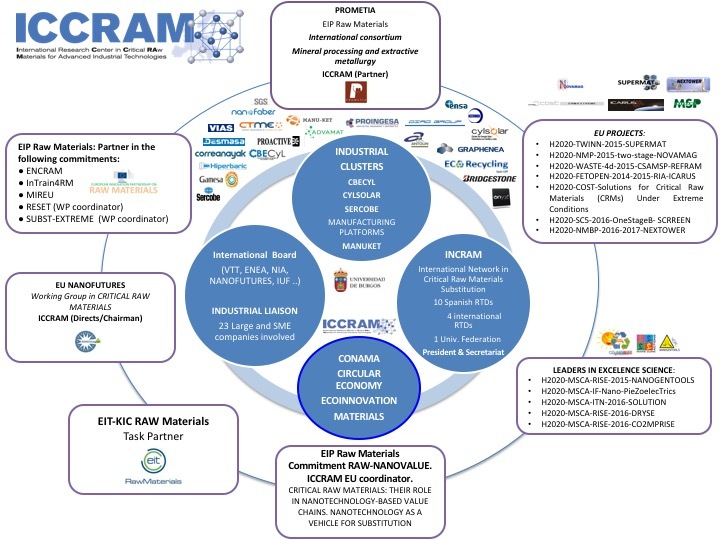 ICCRAM is a leader actor within the European Innovation Partnership in Raw Materials (EIP Raw Materials) taking part in 6 commitments and coordinating an strategic one (RAWNANOVALUE) linking the future of EU Nanotechnology and Materials value chains to the efficient use and management of Critical Raw Materials. In addition, ICCRAM is task partner in the Knowledge and Innovation Community from the European Institute of Technology (EIT-KIC-Raw Materials). ICCRAM also leads the Critical Raw Materials Industrial and Resource efficiency Strategy in Castilla y Leon (Spain), where it is a key agent in the RIS3 plan of this region. UBU-ICCRAM is a founder member of industrial clusters such as CYLSOLAR (Castilla y Leon renewable energy and energy solutions Cluster) and CBECYL (Castilla y Leon capital goods and industrial automation Cluster), maintaining a strong alliance with large scale industrial associations lihke SERCOBE (National Association of manufacturers of capital goods) and international organizations as EU-NANOFUTURES, The European Energy Research Alliance (EERA), or the Nanotechnology Industries Association. ICCRAM was born conceived to integrate within its structure an "intrinsic path into innovation", and it is supported by an industrial board of more than 26 industries, SMEs and clusters. Moreover, ICCRAM coordinates an industrial platform with the City Cuncil in the context of transition into Circular Economy.